Dramatic scenery, abundant wildlife and a rich cultural heritage stretching back millennia, the wonders of the Western Isles are manifold. A deserted white-sand beach; a meadow carpeted in wildflowers; a fleeting rainbow in the changing light; an archaeological treasure hidden in the wilderness; seals sunbathing in a sheltered cove; eagles soaring high up ahead; otters diving into the depths of a sealoch; the rasping call of a Corncrake unseen in the machair; these are everyday sights and sounds on North Uist, home to Tigharry Schoolhouse. One of Europe’s most unspoiled holiday locations, this is a place where the elements hold sway and every day carries the possibility of an unexpected encounter or new discovery. Whether you seek peace and solitude, or the thrill of adventure, a stay at the Schoolhouse will allow you to experience the very best the islands have to offer. There is plenty to discover within the Uists; explore the Udal peninsula with its breath-taking beaches and ancient archaeological remains; hike in the remote mountains of eastern South Uist; take a boat safari to photograph seals on the uninhabited Monarch Isles; play golf at the famous Tom Morris designed course at Askernish; discover Coilleag a’ Phrionnsa beach on Eriskay, famous as the landing place of Bonnie Prince Charlie and as the real life-setting of the film Whisky Galore; or head to Berneray for a picnic on it’s three mile stretch of pristine sand, framed by the Harris hills; there are countless possibilities. The islands offer activities to suit all ages, interests and levels of fitness. Below we have set out some of the myriad things you can see and do while on a visit to the Schoolhouse. We hope this helps prospective guests with their trip planning, but should you have any queries related to particular pursuits, then don’t hesitate to get in touch. Please note, more detailed information regarding activities and providers is supplied to all guests with confirmed bookings. 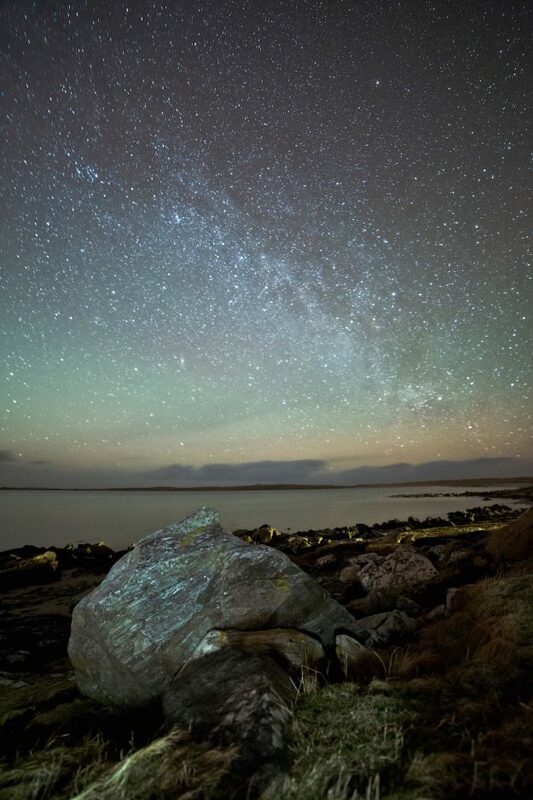 While spring and summer are undoubtedly a beautiful time on North Uist, it’s worth noting that autumn and winter provide their own rewards – abundant wildlife (otters, seals and deer in autumn) dark starry skies with the potential of seeing the northern lights, roaring fires and bracing coastal walks. The Gulf Stream keeps the winter climate surprisingly mild (winter low temperatures are not so different from those in the South East of England) and while you may well experience the islands in wind, rain and mist, the accompanying changing skies and stormy seas adds a spectacular drama to the landscape that you just don’t get at other times of year. What’s more, out of season it’s possible to sail directly from Oban to Lochboisdale – one of the loveliest ferry crossings from the mainland to the archipelago. The Schoolhouse is also a wonderful place for a family Christmas or New Year break. The space, light and facilities of the house perfectly suit a mixed-age group; local smoked Salmon and Venison can be delivered straight to the door; and you cannot beat a Boxing Day walk on a deserted Hosta Beach or a New Year’s Eve ceilidh (folk dance) with the locals! While some of our guests enjoy the freedom of discovering the islands at their own pace, we fully appreciate that for others, a relaxing holiday means somebody else taking care of the logistics of activities and excursions. For this reason, we offer Schoolhouse guests the opportunity of a guided (or semi-guided) holiday experience, with day excursions tailored to their personal interests and the islands’ best seasonal scenery and wildlife. 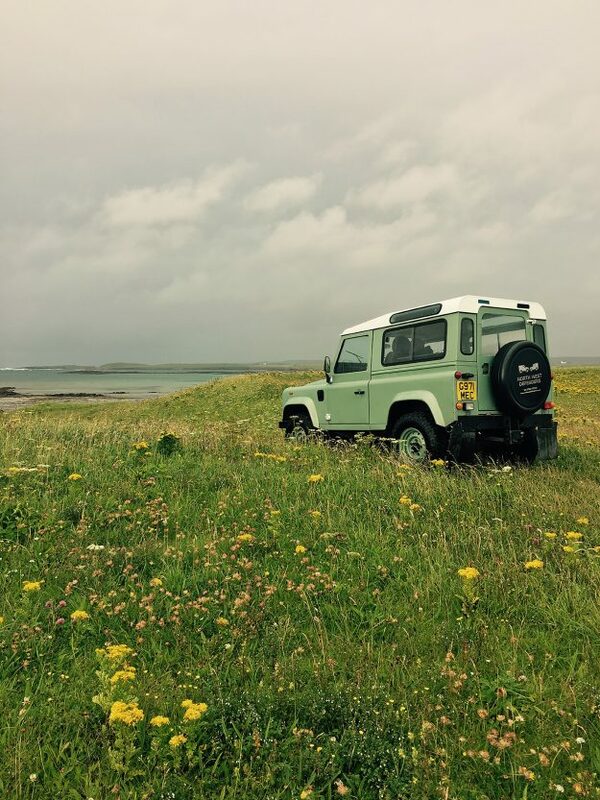 We have a partnership arrangement with a North Uist native and former wildlife ranger whose has unparalleled knowledge of the islands’ flora, fauna and marine life and is also an experienced skipper and ghillie. We are really pleased that through the autumn, winter and early spring, Schoolhouse guests will have the opportunity to benefit from his wonderful island expertise. Depending on the season, activities might include 4 x 4 wildlife-spotting experiences; night safaris to search for deer or birds of prey; walking tours to visit remote archaeological sites; boat trips to uninhabited outlying islands, sunset barbeques or picnics on deserted beaches; fishing and foraging expeditions to catch lobster, shellfish or salmon, visits to working crofts or local mills; guided excursions to visit the best locations on Harris and Lewis; – to name just a few! Bespoke, three, five or seven day itineraries can be organised for guests, including pick-up and drop off at the Schoolhouse, lunch (and dinner if requested). Please note, planned, guided itineraries of this nature must be discussed and booked in advance, as part of your Schoolhouse booking. Please contact us should this be of interest to you and your party. Costs will be additional to accommodation charges and will be dependent on the length of itinerary selected, number of participants and exact activities chosen. As one of the most unspoiled corners of the British Isles, the Uists are an unparalleled natural haven for all manner of wildlife. North Uist has been designated a natural scenic area by Scottish Natural Heritage, and the machair (Gaelic for fertile plain) which makes up much of its north and western coastlines, is one of the rarest habitats in Europe, a unique grassland landscape that has developed over thousands of years, formed by strong Atlantic winds over crushed shell sands, and the traditional methods of cultivation practiced by generation upon generation of islanders through the centuries. The result is a special environment rich in native flora and fauna, where upto 45 different plants can be found in a single square metre. During the spring and summer months the Uist coastline is a carpet of wildflower meadows, a haven for Western Isle bird and insect life. The flowers attract rare insect species including the Great Yellow Bumblebee and the Belted Beauty moth, while a rich variety of wading birds, alongside Lapwing, Golden Plover and the endangered Corncrake also make this habitat their Northern European home. The Schoolhouse is located a 15-minute walk from the RSPB reserve at Balranald, a wonderful place to observe the island’s distractive coastal birdlife, but it’s often possible to spot many of these species right by the house; in the garden, paddock and across Loch Eubhal. Up in the moorlands and on the east of the islands, birds of prey are a common sight; Golden and white-tailed eagles, short-earned owls, hen harriers and kestrel to name a few. Red deer, otter and mountain hare are also resident across the Uists, while the waters surrounding the archipelago play host to a richly biodiverse marine environment, home to seals, porpoises, orca whales, minke whales, basking sharks and several species of dolphin. 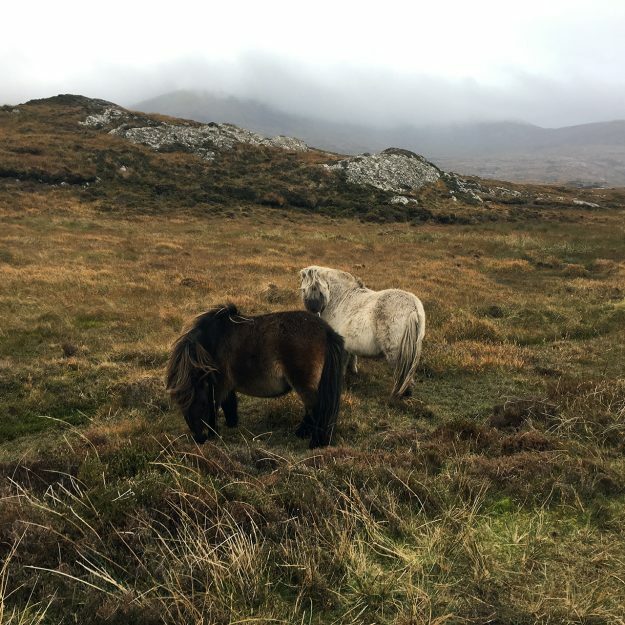 For young children, one of the most delightful animals found on the Uists are wild Eriskay ponies, native to the islands and found on South Uist and Eriskay. The best ways to observe the islands’ wildlife at close quarters is through wildlife tours, guided walks and safaris. These can be arranged through the Schoolhouse or independently. The Uists offer excellent walking country with varied terrain providing routes suitable for all abilities. Whether you prefer long beach rambles or hikes in the hills, the flat plains of coastal machair or upland moors and lochscapes, stunning scenery and wildlife will be your constant companion wherever you choose to roam. 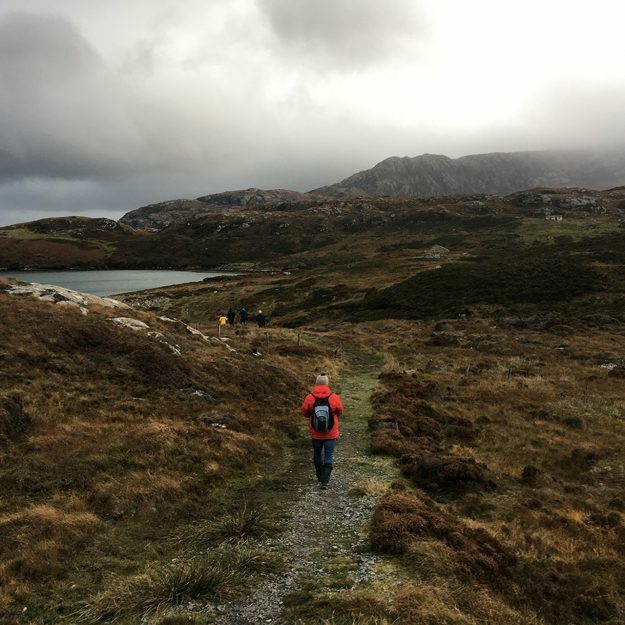 One of the best things about walking in the Hebrides is Scotland’s right to roam policy which means you can explore off the beaten track – in fact in many cases you will find there is no track! But dusting off your walking boots is undoubtedly the best way to see Uist’s hidden treasures, as much of what makes these islands so special remains unseen from its roads. 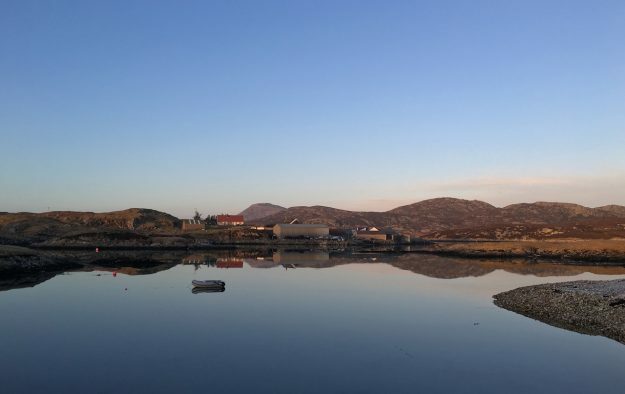 Gently undulating North Uist has wonderful coastal and lochside walks; with its relatively low topography, even a short accent up one of its hills will reward you with magnificent 360-degree views across the loch-strewn landscape and out over the ocean. On clear days you might see the Skye’s Cuillin range on one side and the St Kilda archipelago on the other. For those searching for something altogether more challenging, the remote eastern mountains of South Uist are the perfect choice; their cliffs falling away into the Little Minch to the east, and the island’s long, sandy, western shoreline visible in the distance. 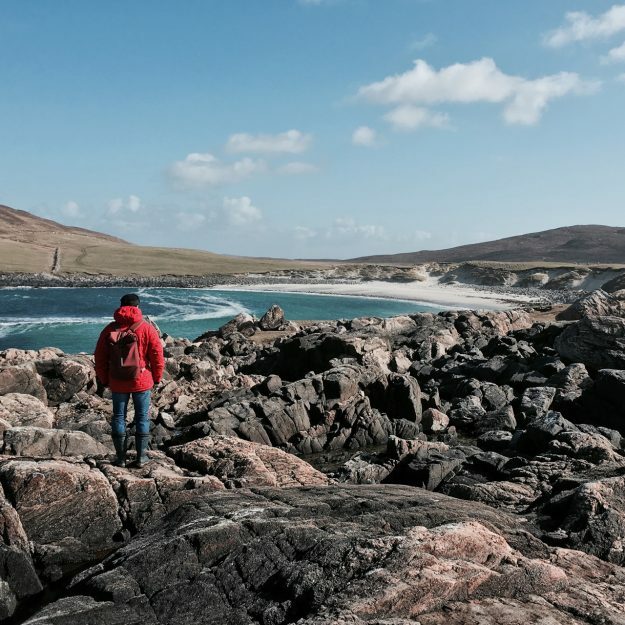 For many, walking on pristine, white-sand shores is one of the greatest pleasures of a trip to the Outer Hebrides, and here the Uists cannot fail to impress. Along the north and west coasts of the islands you will find beach after beach; from the three-mile stretch of Berneray West Beach, to the connected bays at Clachan Sands (Traigh Hornais and Lingeigh); from the gorgeous beaches of the Udal peninsular to the beautiful dune-backed Hosta; from Howmore, with the dramatic backdrop of South Uist’s Beinn Mhor mountain, to Coilleag a’ Phrionnsa, the landing point of Bonnie Prince Charlie on Eriskay; the Uists have beaches of all shapes, sizes and characters – all perfect for strolls, long or short, and where often, you won’t meet another soul. Cycling is a popular activity across the Outer Hebrides. Within the Uists there is plenty of opportunity for on or off road riding, with routes suitable for all ages and abilities. The short circuit from the Schoolhouse to Hoglan Bay and Balranald is ideal for younger children, while cycling is also an excellent way to explore the smaller causeway-connected islands of Grimsay, Eriskay and Berneray. 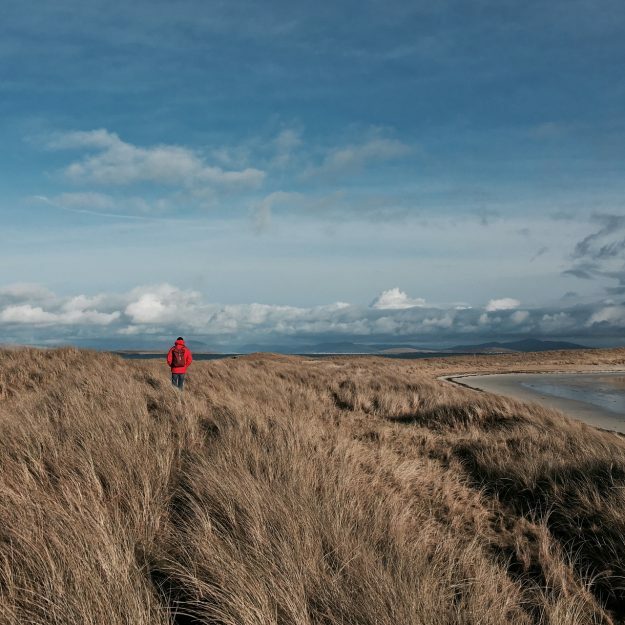 On South Uist, the delightful Machair Way skirts the western shoreline for 35 miles, while inter-island bike and ferry visits can make wonderful daylong excursions. South Harris, for example, makes an ideal cycling day trip with an excellent circular route that passes beaches, lochs and hills (circa 30 miles). Cycle hire is readily available on North Uist, and by prior arrangement, bikes can be delivered/collected directly to/from the house, or to a point of your choosing. Two adult bicycles are also included as part of the Schoolhouse hire and are available for guests’ use. If the weather is amenable, one of the nicest ways to explore the archipelago is to get out on the water in a light craft. There are myriad small, uninhabited offshore islands that can only be accessed by boat and several operators offer water-based wildlife expeditions, for example; to deserted coves and inaccessible beaches; safari-style in pursuit of pods of dolphins, whales or sea eagles; or on sea-fishing trips where you can combine catching your supper with observing bird and marine life. An added exhilaration of some excursions is the adventure of traveling at fast-speed by RIB! (Though for those less adventurous, regular vessels do also venture out!) Once you’ve set out on your voyage you may find yourself face-to-face with seals on the Monach Isles or puffins on Mingulay; spotting nesting eagles on Ronay or enjoying sundowners on Pabbay. All without ever encountering a soul outside of your own travelling group. Yes, these sometimes forgotten islands remain little explored and offer huge natural promise for those intrepid enough to visit them! Please also see the separate section on visiting St Kilda. The Outer Hebrides are a fantastic place to paddle. North Uist in particular, with it’s many hundreds of sea-lochs and inlets is recognised internationally as a one of the best places in the world for sea kayaking expeditions, especially for those with some prior experience. Seeing the remote majesty of the island’s eastern coastline from the water is really something special (much of the eastern Uists is inaccessible by road). The many small offshore islands – Pabbay, Vallay, Ronay – also make wonderful kayaking excursions and you will be sure to see a wide range of bird and marine life as you paddle. For those with limited/no kayaking experience, day-long tuition-based sea kayaking adventures can be arranged from the Schoolhouse. The Outer Hebrides are an exhilarating place to surf; powder white sand; a choice of unspoiled, idyllic (mostly empty!) beaches and fantastic swell. Hosta beach (a 5 minutes drive from the Schoolhouse) is North Uist’s surfing hot spot, fast becoming a cult location amongst the surfing community. Facing north-west, with magnificent waves rolling in from the Atlantic and a clear-day view of St Kilda, in the right conditions it offers unparalleled surf. Of course, it is by no means the only place to catch the waves – pretty much all the beaches across the Uists offer great surf and the more sheltered northern beaches are ideal for beginners and the less experienced. They are also perfect for kite-surfing, paddle-boarding and boogie boarding. For those who are new to surfing, beginners’ lessons can be organised as part of a day trip from the Schoolhouse. With crystal-clear waters that teem with marine life, snorkeling is a wonderful way to explore the sea from Uists’ beaches – spot crab, lobster, sea urchins, forests of seaweeds and much besides, the (underwater) world is your oyster! For the more adventurous, snorkeling in the islands’ lochs, can provide can provide a thrilling and unique experience. Snorkeling equipment and wetsuits can be hired locally and guided trips can also be organised for Schoolhouse guests. The unbeatable thing about being located on this coast of North Uist is that you find yourself the closest you can be (on the mainland Outer Hebrides) to the legendary St Kilda archipelago. On any clear day, you will be rewarded with views of these mysterious islands, 40 miles off the coast and last inhabited in 1930. Unesco has awarded St Kilda dual world heritage status, recognising both its spectacular natural landscape (home to Europe’s highest coastal cliffs and the largest sea-bird colony in the Atlantic) and its rich cultural heritage (the islands’ archaeology suggests human occupation stretching back several thousand years). For many, a visit to this enigmatic, edge-of-the-world destination is top of their travel bucket lists. 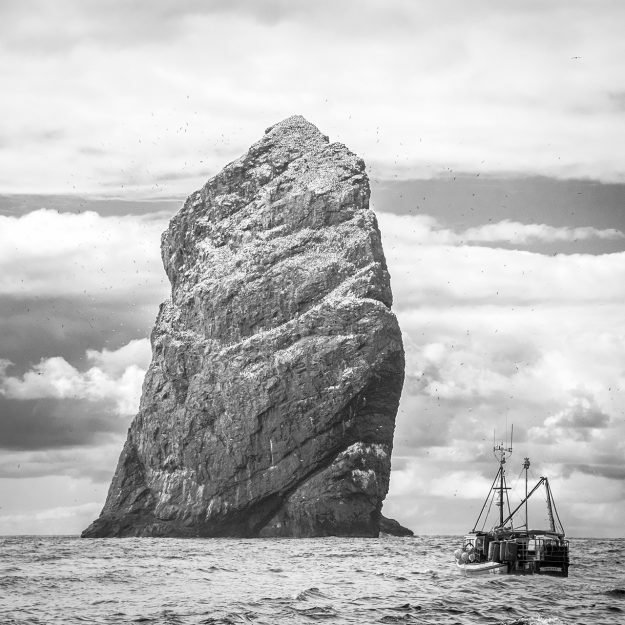 A day-visit to the islands is perfectly possible from the Schoolhouse, (though please be aware that weather plays a significant role in the ease and ability to reach St Kilda on any given day, trips must be booked in advance and cannot be guaranteed!) Most day excursions leave from Leverburgh on South Harris (an hour’s ferry ride away), but we have arrangements in place with local operators to ensure it’s straightforward for Schoolhouse visitors to join one of these tours, with the potential for pick ups and/or drop offs from Berneray/North Uist. 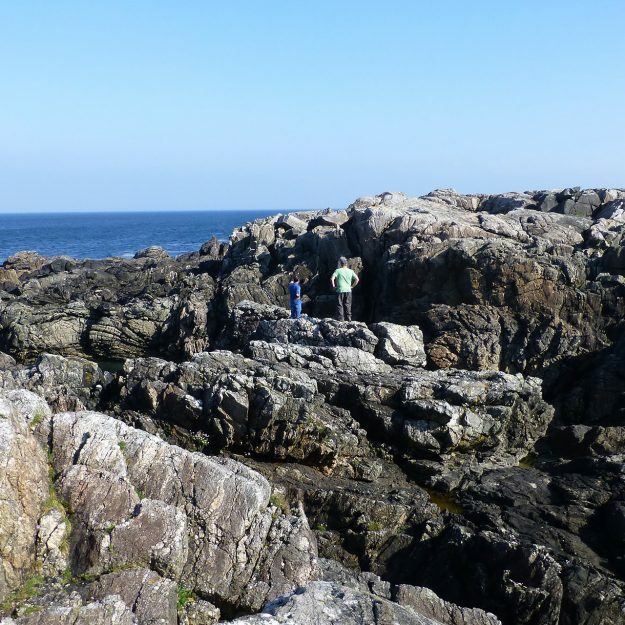 It’s also worth noting that there are several other fascinating uninhabited offshore islands that can be visited on day trips from the Schoolhouse. These include the beautiful Monarch Isles (four miles off the coast of western North Uist, uninhabited since 1947 and now home to one of the largest breeding populations of grey seals in the world); and Mingulay (uninhabited for over a hundred years and famous for it’s huge colonies of seabirds, in particular puffins). Lovers of these traditional Scottish pursuits will find no shortage of opportunity to indulge in the Uists. Fishing is an incredibly popular activity across the islands. North Uist in particular, with its plethora of fresh and seawater lochs, tidal pools and inter-island sounds is a mecca for anglers who come to fish the abundant sea trout, brown trout and salmon. A day’s fishing in the peaceful isolation of a loch-ridden landscape, with little but the occasional eagle or otter to interrupt the stillness, makes for a truly memorable angling experience. And what could be better than returning home to bake or barbecue your catch? For those who like to fish under their own steam, rods and equipment can be hired locally and permits are easy to obtain; for those who would prefer to be guided to the best spots or to fish in the open water, organised excursions in the company of an experienced skipper/ghillie can be arranged. It is also possible to fish in Loch Eubhal, directly opposite the Schoolhouse, where, during the season a rowboat for anglers is always located. (Please note a permit is required to fish in Loch Eubhal). Golfing on the Outer Hebrides is a unique experience. It offers players an unforgettable 9 or 18 holes in an unparalleled coastal landscape with Hebridean hospitality to match. The Uists are blessed with two wonderful golf courses both spectacularly located overlooking the Atlantic; while two further courses are within easy reach on Barra and on South Harris. Each of the courses has its own style and all offer different challenges, however, the pick of the bunch is undoubtedly Askernish – the acclaimed 18-hole links course on the western shores of South Uist. Originally laid out in 1891, Askernish was designed by the Scottish golfing pioneer Old Tom Morris and enthusiasts journey from around the world to tee off on its fairways. All the Hebridean courses are open to non-members (fees apply) and at Askernish clubs/trolleys can be hired. On request, golfing excursions with a local guide/player can be arranged for Schoolhouse guests as part of a bespoke itinerary. The islands of the Outer Hebrides have a rich and fascinating archaeological history; indeed across the Uist’s there is evidence of human occupation dating back several thousand years. 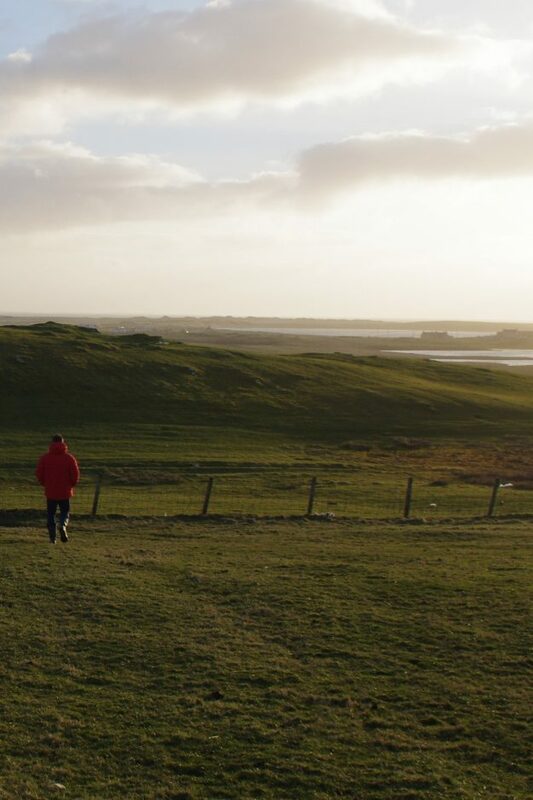 A landscape scattered with historic sites, the prevalence of ancient burial chambers suggests North Uist was an important location in Neolithic times, while iron age brochs and wheelhouses are a testament to its continued occupation through the centuries. 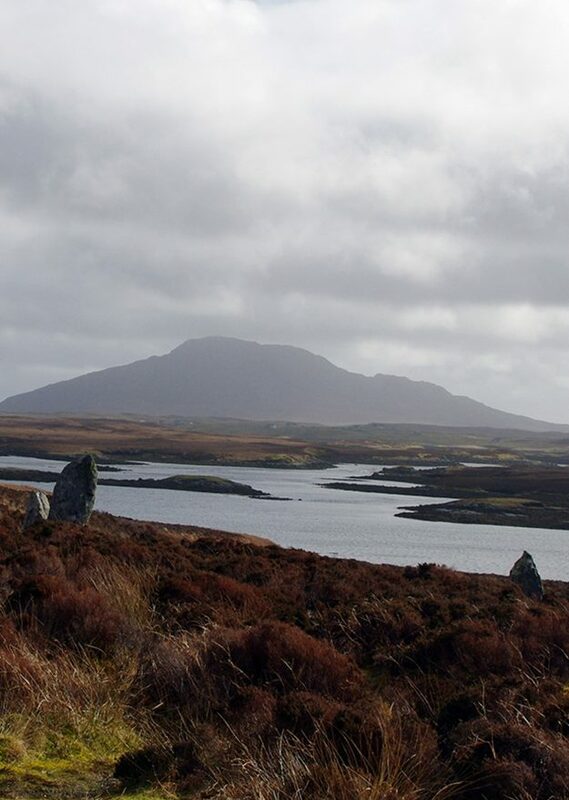 On the Udal peninsula on North Uist’s north coast, archaeological finds provide an unbroken timeline from the Neolithic period, right through to the 1900s. This evidence of ancient settlement is ever-present across the islands, and in recent years a plethora of sites have been discovered beneath the peat bog and machair – these even include prehistoric mummies on South Uist! Some of the best archaeological locations to visit locally include the Neolithic Chambered Cairn and Stone Circle at Barpa Langass, both thought to be around 5000 years old. Known in Gaelic as Pobhul Finn, the latter is the only stone circle in the Uists. Further afield, a day trip can take you to see the famous Callanish Standing Stones on Lewis. One of the best ways to bring to life these historical narratives is through guided archeological tours, which can be arranged for Schoolhouse guests. The small island museums at Lochmaddy and Kildonnan also have interesting related exhibits and often host talks/events associated with the islands’ archaeological discoveries. One of the most captivating things about the Uists is their wonderful, sometimes otherworldly quality of light; it is truly mesmerising – particularly in the autumn and winter, when the sun is low on the horizon. This makes the islands a very popular location for photography, both with professionals and keen amateurs. You never know when the opportunity for an amazing photograph will present itself, as the light, like the weather, is ever shifting. Alongside huge skies, varied land and waterscapes, this makes for myriad opportunities to exercise your camera skills, especially as the light can sometimes transform the same vista from one moment to the next. 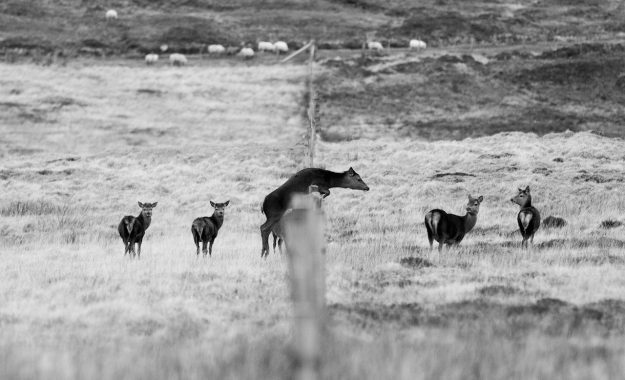 If Schoolhouse guests are interested in photographing a particular element of the natural landscape, wildlife (or for that matter Hebridean life/culture) we would be more than happy to help point them in the right direction. The lack of large-scale development on the islands means that the sky is as important a feature of the landscape as the machair and moorland. On North Uist particularly, which has few hills, there are huge and dramatic vistas that are ever changing with the weather and the seasons. This also makes it an ideal place for stargazing at night. Step outside once it’s dark, and if the day has been clear, watch a universe of stars appear before your eyes. During the winter, the islands are also one of the best places in the country to catch the elusive Northern Lights (Aurora Borealis). Crofting, (a traditional Scottish form of low-impact sustainable farming), is integral to life on the Uists and has been practiced by islanders for generations. Many croft smallholdings have been passed down through the centuries and are still worked by island families in order to raise livestock and grow crops. The continued cultivation of croft lands is key to the islands’ distinctive natural habitat and the habitual grazing of sheep and cattle on the machair has helped to maintain the unique characteristics of the landscape. Most of our neighbours at the Schoolhouse keep cows, sheep and chickens, and the lambing season is spring is an important feature of the crofting calendar. Watching newborn lambs on the machair in April and May is a wonderful sight, and we often have sheep grazing in the Schoolhouse paddock at this time of year. For guests who are interested (and by prior arrangement) we can organise a visit to a working croft where you will be able to see the animals at close-hand and experience some of the time-honoured practices of Hebridean farm life. Gaelic culture is an important part of island life and many residents of the Uists still speak Scotts Gaelic as their primary language. Folk music and dance are integral to the Gaelic tradition, and throughout the year musical events take place at the islands’ community halls, arts’ venues and public houses. These are open to all and are a wonderful way to experience Hebridean culture – you will be sure of a warm Uist welcome! In recent years there has been a resurgence in interest in Gaelic studies and a new cultural centre is soon to be built on South Uist with plans for an extensive programme of events showcasing the best of Gaelic piping, fiddling, song, dance and poetry. The Uists are home to three small-but-perfectly-formed museum-galleries, one each on North and South Uist and one on the island of Grimsay. The latter, a delightful ‘micro-museum’, documents the historic practice of boatbuilding at Kallin Harbour, while the larger cultural centres of Taigh Chearsabhagh in Lochmaddy and the Kildonnan Museum feature informative permanent exhibitions on the history and culture of the Uists (as well as a busy programme of visiting art exhibitions and community events throughout the year). In addition, with a number artists and photographers resident across the archipelago, there are several home studio/galleries open to visitors. Many of these practitioners have been drawn to the islands’ natural environment and take inspiration from the Hebridean landscape and light. 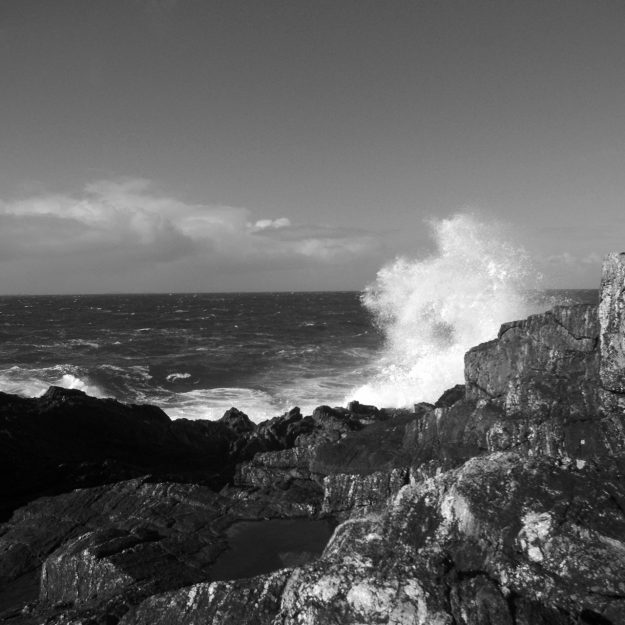 Inspired by traditional Outer Hebridean craft techniques and the often awe-inspiring colours and textures of the natural landscape, a number of practitioners and small organisations manufacture craft products on the islands. These include wool, jewellery, ceramics, and most famously, the world renowned Harris Tweed. This unique material (protected by its own act of parliament!) is only made at a handful of mills within the archipelago. For those particularly interested in how the fabric is produced, day trips can be arranged to see the weavers in action. Closer to the Schoolhouse, the fantastic community mill project ’Uist Wool’ on Grimsay, spins beautiful yarn from the fleeces of Uist croft sheep using traditional methods and heritage machinery. Established in 2013, the mill’s development was driven by the agenda to bring ‘fresh purpose for local fleece that would reconnect the community with their cultural heritage of wool-working’. The dedicated wool centre is open year round while in-depth mill tours take place through the summer and can also be arranged by appointment. A trip to the Outer Hebrides would not be complete without sampling some of the islands’ wonderful local produce; there is plenty to get gourmands salivating! Uist peat-smoked salmon and mackerel, hand-dived scallops and freshly-caught lobster are all available a stones throw from the Schoolhouse, along with croft-fresh eggs, sustainably-sourced wild goose and local venison meat. The acclaimed Hebridean Smokehouse on North Uist supplies stores and restaurants across the globe. With shop premises that include a viewing gallery, visitors can see how the newly-caught fish are processed and infused. For an even more boat-to-table experience head to Kallin Harbour – it is near impossible to visit at lunchtime without purchasing some just-landed shellfish! Alongside these delicacies, a small community of artisan producers make cakes, condiments and preserves, available at the islands’ shops and cafes. Why not try Crowdie, a traditional Hebridean curd cheese or the celebrated Stornoway black pudding? 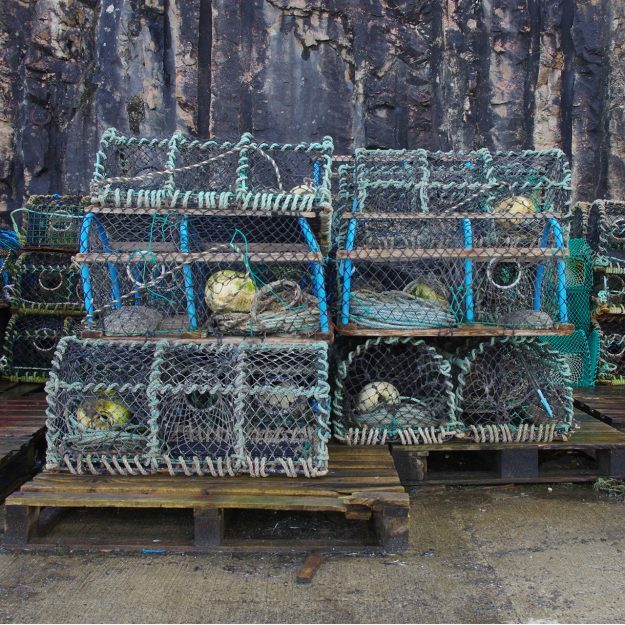 The islands’ specialty produce can be sampled across Uist’s restaurants and pubs, but for those intrepid visitors additionally interested in gathering elements of their own supper, the seashore offers excellent opportunities to forage for razor clams, edible seaweeds and other shore plants. Look out for Pepper Dulse, reputedly the truffle of the sea! Food is of course only half the story. The Outer Isles have a small but thriving collection of craft gin, whisky and beer producers and a range of local, Hebridean beverages are available across the archipelago. At present, the islands boast two artisanal gins; Barra Atlantic Gin and the Isle of Harris Gin, each infused with local seaweed and botanicals. The latter has recently established a fantastic community distillery and visitor centre on South Harris, while the former has plans to follow suit. Both are currently expanding into single-malt whisky production, but like all good things, this distinctive Scottish tipple takes time to develop and mature! In the meantime, the Abhainn Dearg Distillery produces a lovely single-cask malt, distilled and bottled by hand in Uig on Lewis. 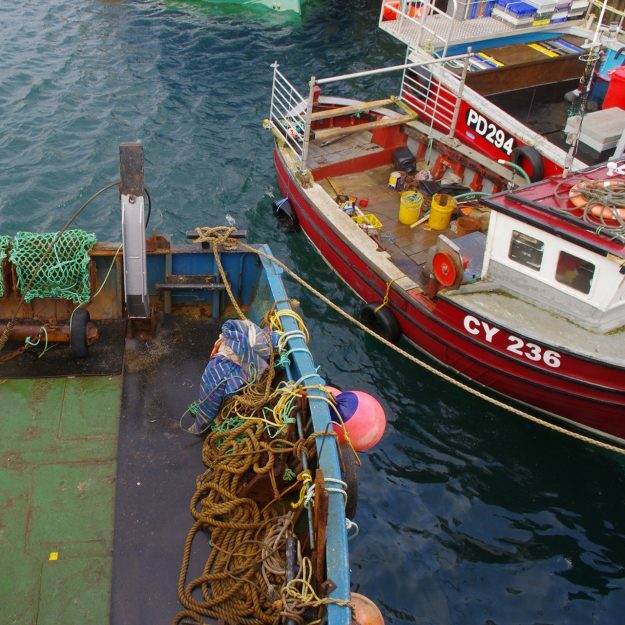 Social, cultural and sporting events take place across the Uists (and beyond!) throughout the year. Here are some of the annual fixtures and festivals that form part of the islands’ cultural calendar along with their approximate dates (check www.visitouternebrides.co.uk/whats-on for latest information). 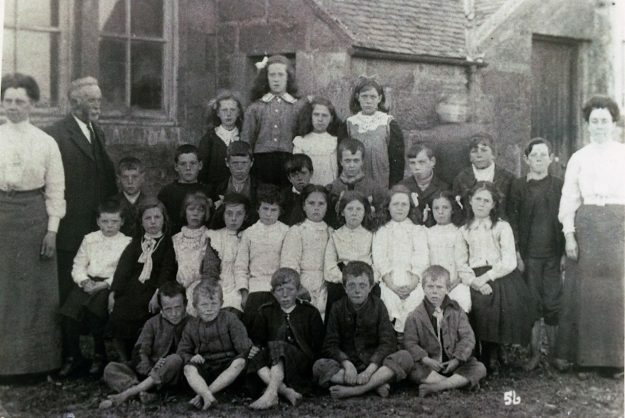 Why not organise a visit to the Schoolhouse around a scheduled event that suits your interests? You’ll be sure to receive a warm Western Isles welcome and experience a true slice of Hebridean, island life. Take a day trip to Harris during the wonderful Harris Mountain Festival in May. Lots of guided walking/trekking and sea based activities. A three-day whisky festival on the wonderful island of Eriskay on/around Midsummer’s eve. Whisky, seafood, Gaelic music and dancing. Set to become an annual event from 2017. Bi-annual sailing race from Lochmaddy to St Kilda and back, through the Sound of Harris and out the Atlantic. An accompanying onshore programme takes place concurrently. A tradition throughout the Highlands and Islands and one of the highlights of the summer calendar! Highland Games are held on both North and South Uist on different weekends in July. There are always events for all ages, including pipe competitions, tossing the caber, tug of war, track/hill races and plenty besides. The North Uist Highland Games are held annually at Hosta, a 15 minutes walk from the Schoolhouse. The yearly North Uist agricultural show is traditionally held in July or August on the Hosta machair. The show is a great community event which showcases the best livestock and produce of the island. Prizes for ‘best in show’ across a host of categories are awarded annually, from sheep and horses, to vintage tractors, home grown vegetables and baking. There are always stalls selling crafts, farming demonstrations, local food/drink etc. Three day music festival held annually in Benbecula at the end of July attracting visitors from across Europe. Features a range of bands/musical styles with a focus on folk music. An annual festival with varied events celebrating the island of Berneray it’s history, culture and natural landscape. There are normally lots of family-friendly and beach based events. Normally held in Borve, Berneray during the second week in July. Always fun to watch! Annual week-long celebration of Gaelic song, dance and music, taking place in locations across South Uist and Benbecula. Always features concerts and ceilidhs. 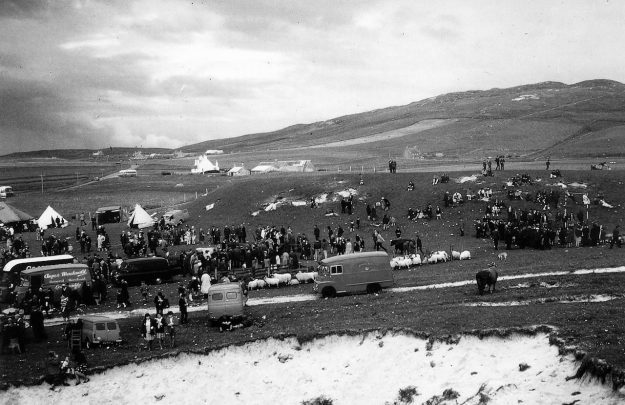 Two-day community music festival held annually on the machair of western Barra. Makes a lovely day trip from the Schoolhouse. Takes place in locations across the Uists over the August Bank Holiday weekend. Expect talks, workshops, demonstrations, foraging trips etc. A multi-discipline two-day Adventure Race for individuals and pairs involving, running, cycling, kayaking across the Uist’s and Benbecula. A celebration of the island of Grimsay, its people, culture and maritime history. Expect, exhibitions, workshops, talks and a sparkling bonfire around November 5th! Copyright ©. Tigharry Schoolhouse 2017. All rights reserved. Simply enter your email address below to receive up to date information and promotions about this property.